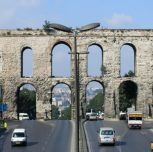 It is one of the historical and magnificient fountains of Istanbul, which was built on the site of the previous Byzantine fountain called “Peryaton” by Sultan Ahmet III (1673-1736) in 1728. 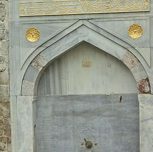 The fountain lies in front of Bab-ı Hümayun, the gate of the Topkapı Palace and overlooks the square due to its position in the center of the Ayasofya square. The structure, which has a water reservoir in the shape of an octagonal prism located in its center, consists of sabils (public fountain) fitted on the corners of the water reservoir and water faucets fitted on its sides. The primary structure, which is placed on a floor with two stairs, features an aesthetic view of various architectural works, such as plant motifs, decorations, muqarnas (a three-dimentional decoration of Islam architecture), and palmets and it is supported with borders and niches used on the fountain. Moreover, the framed word of "Maşallah" (meaning may God preserve one from evil) written in calligraphy in medallion and real flower motifs drawn in the long vases carry spectacular display of artistry. A lead-covered wooden roof which constitutes the ceiling structure of the fountain was extended in all directions in order to protect it against the negative effects of sunlight and other environmental damage. The roof has an artistic value by getting free of simplicity with little domes on top of the fountain and decorations on wooden eaves. 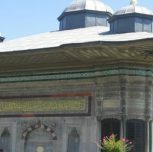 The inscription on the fountain written with “talik hat calligraphy” is by Seyyid Hüseyin Vehbi bin Ahmed, a poet and judge of the cities of Kayseri and Aleppo which ends with praise for Allah (s.w.t): “Turn on the tap in the name of Allah (s.w.t), drink water and pray for Sultan Ahmed.” It is rumoured that the last verse of the inscription was said by Sultan Ahmed III and there is the signature of the Sultan Ahmed III at the end of the inscription. 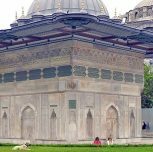 This monumental fountain, which was built when Western influence was at its greatest point during the final period of the Ottoman architectural period shows the transition from Classical to Baroque architecture. It invites tourists, who come to Istanbul and have an opportunity to see the fountain, to journey back in time to the 18th century.